Actor: The Danish-American Hollywood star Viggo Mortensen is tired of the endless promotional tours that accompany his screen work. That's why he will take at least one year's leave. This Saturday he opened a photo exhibition in Roskilde, on Monday he is turning 50. He doesn't really want to greet us. Or to do the interview. Actually he doesn't even want to make movies anymore. Viggo Mortensen is lying on the floor when the photographer and journalist enter the Palæfløjen in Roskilde. The place the King of Denmark used as a residence from 1536 when he was away from home. So maybe the King has returned? Or maybe it is a deeply focused artist who obstinately stays on the floor when the press interrupts him. He wears a T-shirt, jeans and socks. The latter with big holes. On the chest of the red T-shirt it says "Hungary". It is a gift from the crew he worked with in Hungary when he made the movie Good. Even though we have been in the room for five minutes, he pays no attention to anyone else other than the Secretariat Manager and his art. But at last our presence is noticed. "I can't do more than one thing at a time," Viggo says gesticulating. He just wants to do his job. And a job it is. Writing poems, taking pictures, making paintings and arranging exhibitions is just as important to him as acting. If not more. Or important in a different way. As a Hollywood actor, Viggo Mortensen has earned a lot of money. And he needs it. Among other things he is in charge of the finances of the publishing company he founded 6 years ago. Perceval Press is a specialised publishing company that publishes books no one else believes in. "The last five to seven years I have done well by making movies. That means I also have been doing other things," says Mortensen, after he has turned his attention to us. And the person that at first sight seemed turned inwards and distant, is now acting bubbling, warm and kind. "But I will quit making movies anyway - at least for a while. And I am planning on doing this very soon," he declares, but at the same time emphasizes that he will complete the promotion of the movies he shot the last year. The movies he's worked on are Good, Appaloosa and The Road. Three movies praised highly by foreign critics. Which in return have made "wise heads" predict awards. But that doesn't concern Mortensen. He no longer has the energy for the promotion work for the movies. "It may sound exciting, but in reality I sit in a hotel room and talk to people all day. I sleep and travel from country to country. And it has been like that for a long time," saysViggo Mortensen. He wants to enjoy life and have more time for himself, which gives him the opportunity to be something for others. And then he would like to act in a play again. "It's been very, very long since I have done that. But it is fun. And it is finished when I leave the stage. No endless promotion tours lasting three to four months follow," says Mortensen and looks tired by the thought. He hopes to be able to live by his art. The art that does not include movie work. That means he will have to deposit the surplus from the sale of paintings, books and photos into his own bank account. As the world is today, Mortensen usually donates the money to different organizations. The surplus of the exhibition in Roskilde goes to "Dyreværnet" (Protection of Animals) in Denmark. With the movie career on hold, there will be more room for exhibitions like the one in Roskilde. Mortensen has named the photo exhibition sådanset. Because it describes how a person sees the world. How Viggo sees the world. Sådanset. (Seen like this). 192 small photos characterizes the walls in Palæfløjen. They are glued on wooden plates and covered with plexi-glass. They are hanging with approximately 1½ cm. distance on two ruler-straight rows. There are no frames around the photos as it would destroy the fundamental idea of Mortensen. He has tried to create a connection between the photos. Together they make a form of installation, connected by a common line. A sort of horizon that fits through from one image to the next. "That is what I find is interesting in the world. The whole. You can look at details up close - but from a distance it is the whole you see," says Mortensen. He cheers up when the conversation touches sådanset. Mortensen eagerly shows us the small rooms housing his photos. He talks loud and gesticulates while he tells about the history and origin of the images. Some are shot in Argentina, others in Morocco, some at the other end of the world. Some are made in connection with movie works, others on vacation in Denmark. sådanset shows images of landscapes, animals, people, the air and skies. "We are all connected," Viggo Mortensen smiles and regrets that his Danish is a bit rusty. In two days time it will already be better, he promises and laughs out loud. He got the idea for the exhibition while he was looking at pictures and discovered that two of them sort of continued on from each other. He became interested and the next foruteen days he worked his way through a pile of pictures to find photos, that could continue the horizon-line and make the puzzle more complete. Also five pictures from one of Mortensen's earlier books raised his interest. The five photos are very similar, but originate from different continents. The pictures show, according to the artist, that people and landscapes are connected. "This is how I see the world, how it is connected to me. But what the audience gets out of it is out of my hands," says the artist, who has published several books with his own poetry and photos. Mortensen is no novice in the art of photographing. Actually, he has taken pictures since he was 13-14 years old. "Life is short, and the pictures are a way to save my memories," he says while he looks around at the many photos. The photos are moments, he has snapped from airplanes and on the ground. They are abstract and they are concrete. But according to the artist, not all of them are equally exciting. "Some of the pictures are good, even if they stand alone. Others are not that interesting," he judges and continues, "But it is the whole that is important to me." 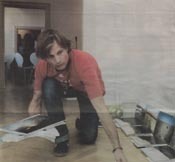 It is the first time Viggo Mortensen has made an exhibition where the whole is more important than the single picture. Earlier he has exhibited on Iceland, in the Robert Mann Gallery in New York and at the museum for Photoart in Odense. Working with the whole means that Mortensen is anxious about the reactions. But when the photographer gives him his professional opinion, he looks less worried. "So you think it is interesting?" Viggo Mortensen smiles before he goes outside and smokes a quick cigarette. When he enters again, he wears a cap over his long hair. It is red and blue. Same colour as the football team San Lorenzo. It is Mortensen's favourite team from Argentina. Football is close to the artist's heart, he plays a bit himself. Besides that he writes poems, plays jazz music and paints. According to himself, he cooks well - and willingly does the dishes afterwards. "Some might say I am a better cook than I am a painter," says Mortensen and laughs out loud. "But that does not make it forbidden to enjoy it," the star jokes. Originally the exhibition in Roskilde should have been with Mortensen's paintings, but he did not have time to finish them as the promotion of his latest movies took up his time. And even if the time disappears quickly in Mortensen's universe, it does not bother him. Tomorrow he will reach the first 50 years. And that happens without any worrying. On the other hand he is grateful for every year he lives. "Yes, I feel that, with age, things go slower for me, and I need to sleep more," says Viggo Mortensen, who expects to celebrate his birthday with his Danish family.